Interior/Exterior Surface Coating Only $1.36 per square foot! Interior/Exterior Surface Coating Only $0.74 per square foot! Interior/Exterior Surface Coating with non-slip technology Only $0.71 per square foot! Interior/Exterior Primer for Concrete & Metal Only $0.32 per square foot! Designed for priming wet concrete substrates. 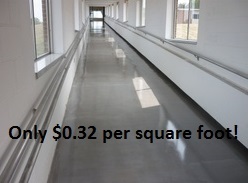 Only $0.29 per square foot!